Heat Pump COP (Coeffient Of Performance) is defined by the ratio of the output power to the input power. 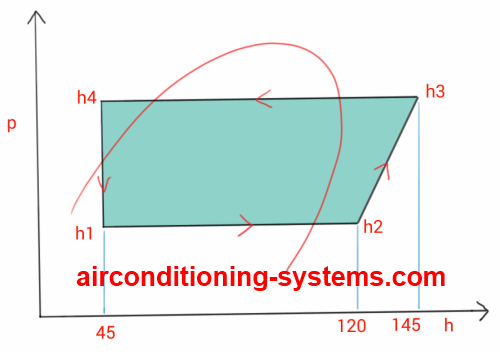 This coefficient is useful when you select a suitable air to air heat pump system for your house or office. By looking at the COP, you can tell how efficient the equipment is. In heat pump system, the heat from the outside of the house is transferred to the inside of the room by vapor compression cycle. Energy is used to move the outdoor heat to the room. The amount of heat that can be moved using the same energy depends on the temperature and humidity of the outdoor. If the outdoor temperature drops, the amount of heat that can be moved will also drop hence the COP will also drop. For example, if the outside temperature is 10 °C and the room desired temperature is 25 °C. This value of 35 is the maximum COP that can be achieved by any equipment according to the theoretical calculation. In actual system, the COP that is obtained is in the region of 2-5. In a vapour compression cycle, the heat pump COP can be obtained by analysing the pressure enthalpy diagram of the compression cycle. This shows that the heat pump system is a better alternative to electric heating as 1 unit of input power is able to output 4 units of power by moving the heat energy from outside the building. Take note that as the outdoor temperature drops to 0 °F, the COP will be reduced as the amount of heat that can be moved to the indoor has now been greatly reduced. Therefore, the COP at this temperature could go down to 1.5 : 1. Some units are fitted with auxiliary heater in that when the temperature outside goes below 0 °F, the heater will turn on to supply the necessary heating for the occupants. Hence, if the location that you are staying often has sub zero °F, it is better to get a heat pump with auxiliary heater built into the unit to ensure that you will still have sufficient heating during extreme winter condition.